The Dinan high flow carbon fiber cold air intake, like most Dinan products, has a sleek and functional appearance that embodies high performance. The Dinan Carbon Fiber Air Intake allows cool outside air to be pushed into the engine via a pair of supplemental carbon fiber intake ducts located at the front of the engine bay. The Dinan Carbon Fiber Air Intake System was carefully designed within tight packaging constraints and in consideration of ideal aerodynamic diffusing angles to optimize the efficiency and performance of this induction system. Each duct leads combustion air through a custom designed intake assembly that has a larger than stock metered air flow housing, as well as a Dinan conical air filter with a larger capacity. 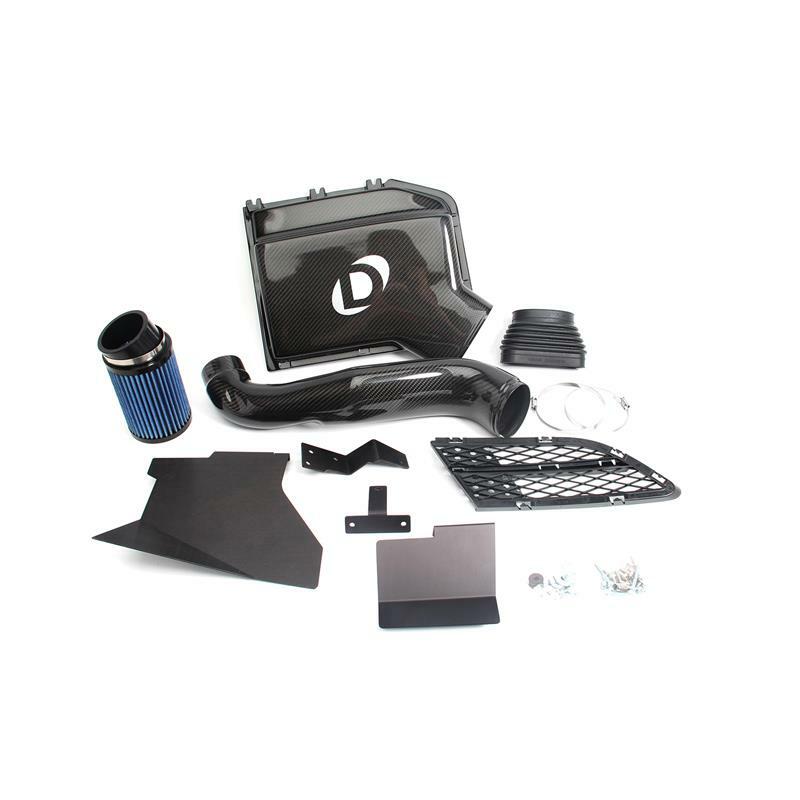 Dinan engineers have painstakingly developed custom tooling to ensure the entire Dinan cold air intake system is sealed like a factory replacement, thereby preventing hot air from the engine compartment to compromise its effectiveness. The stock air inlets are left intact and fully functional to provide a new total of four air intakes into the engine for maximum airflow. Improved induction airflow offered by Dinan cold air intake systems increase engine performance, even more so if used in combination with other performance enhancing Dinan products. This product is not legal for sale or use in California, or states that have adopted California emissions standards, on any pollution controlled motor vehicles. Stock air filters are replaced with larger Dinan conical air filters.